The Sri Lankan government is hailing its "diplomatic victory" following the decision of the UN Human Rights Council to support its humanitarian efforts. Colombo successfully resisted attempts by Western nations at the Geneva meeting - which concluded on Wednesday - to investigate alleged war crimes. The government completed its offensive against Tamil Tiger rebels last week. The army says that rebels are still capable of carrying out hit-and-run attacks but cannot regroup militarily. "We have destroyed the rebel leadership's first, second and third rungs. The Tamil Tigers are over," army commander Gen Sarath Fonseka said at a ceremony to honour his field commanders. "We expanded our troop strength and took a practical approach to finish the war... within two years and 10 months," he said after reviewing a guard of honour. While the army and state-run newspapers continue to celebrate its victory on the battlefield, the government is celebrating what it sees as its triumph on the diplomatic front. It managed to head off attempts by Western countries during a special session of the UN's Human Rights Council in Geneva for an inquiry into human rights abuses committed by both sides. The council session, called because of concerns over the high number of civilian casualties in the fighting and the plight of thousands of displaced Tamil people, ended late on Wednesday with a resolution praising the outcome of the war. "This is a strong endorsement of our president's efforts to rout terrorism, and the successful handling of the world's biggest hostage crisis," Sri Lanka's Human Rights Minister Mahinda Samarasinghe said. "It is a clear message that the international community is behind Sri Lanka." The government had the support of most Asian countries in fending off demands for an inquiry which Western countries argue is necessary to investigate allegations that the rebels used civilians as human shields, while the army subjected them to intense and indiscriminate shelling. The UN estimates that more than 7,000 civilians were killed in the first four months of this year alone. The final resolution, passed by 29 votes to 12 with six abstentions, welcomed what it called Sri Lanka's continued commitment to the protection of human rights. 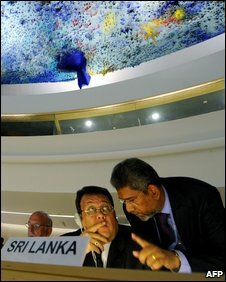 It also urged the international community to provide financial assistance towards Sri Lanka's reconstruction. It said that UN aid agencies wanting full access to the 300,000 displaced people in army-run camps should only receive this "as may be appropriate" and that the war was a "domestic" matter. Human rights groups said it was another sign that the council - supposed to be the world's top human rights watchdog - is now so politicised that it is virtually meaningless. The military has so far refused to release refugees from the camps, saying they must be screened to weed out any Tamil Tiger rebels who may be hiding among them.